Follow your arrow continues to be a fun knitting mkal shawl. I have finished the first three clues now, choosing options 1b2a3b. Hah! It is starting to look like a serial number! I was a bit concerned about the varigated yarn, but all in all, I think the stitch pattern still shines through. I really cannot wait for the next clue, and what direction it will take me. The shawl is a half circle now (although I cannot stretch it out - the needle is too short for that). Here is the link to my Forest Sky on Ravelry. It is also worth a look on the pattern page to see all the different ways this shawl is turning out. It is amazing really how versatile the pattern is. I am sure to make another one, using the different option choices and maybe a solid colour.. 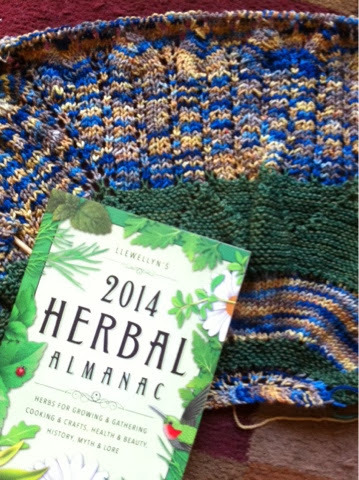 I have been reading the 2014 Herbal Almanac and dreaming about spring and gardening.. This book is filled with so many little tidbits of information. I have high hopes for next summers container herb garden. I am even planning to dig out a spot for some holly hocs and sunflowers. To see what other knitters are reading click here for Ginny's yarn along post.